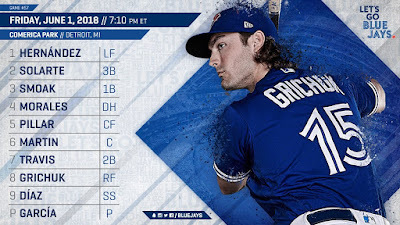 The Blue Jays stroll into Detroit to start a three-game series after enduring an absolutely brutal month, going 9-19 in May - their worst May since 1981 in terms of number of wins. The numbers are ugly: .224 team batting average, 3 or fewer runs scored in 15 games, 5.35 team ERA and they gave up 8 or more runs nine times. Will June be a fresh start for the team, or just a continuation of going belly-up toward a high draft pick in 2019? Stay tuned. 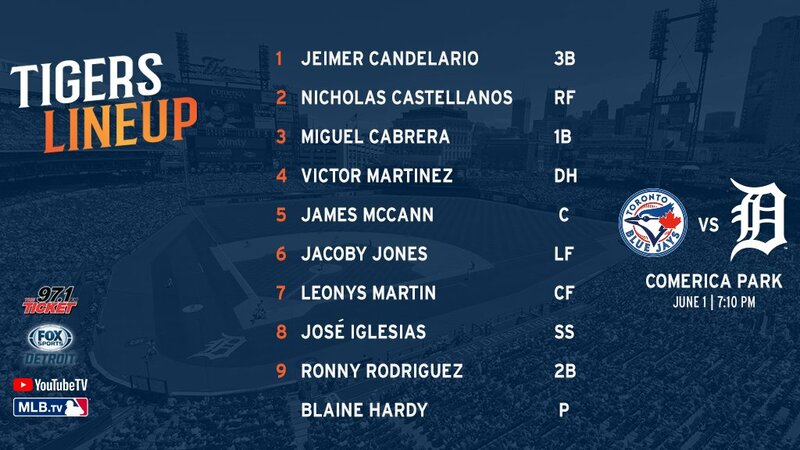 The Tigers, by contrast, have been pleasantly decent (even with the loss of Miguel Cabrera) as many had projected them to be one of the two or three worst teams in all of MLB. He's still in New Hampshire. .414/.464/.691/1.155 with 11 HR and 53 RBI in 49 games. Two games tonight in Binghamton to fatten up his stat line. Roster moves! Get 'em while they're hot! Aledmys Diaz and Randal Grichuk have been activated off the DL, while Dwight Smith Jr. and Jake Petricka have been sent down to Buffalo. Gio Urshela is still on the roster! 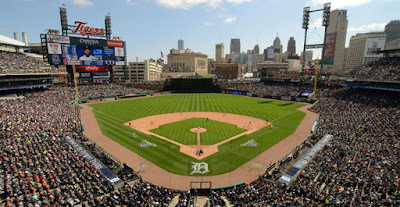 The Tigers have been playing up the 'Rally Goose' on Twitter, pointing out they're 2-0 since the poor thing limped around and flapped his way head-on into a scoreboard facing the second deck. Glad to see the schlubs of Detroit think it's so hilarious to celebrate a goose crashing into the lower level after being chased all over the park and then hitting concrete. When we had the parrot walks, no live parrots were harmed or mangled in the process. Small, interesting factiod: Yangervis Solarte said that Comerica is the only ballpark he hadn't played yet in his MLB career. Check that off the bucket list tonight. 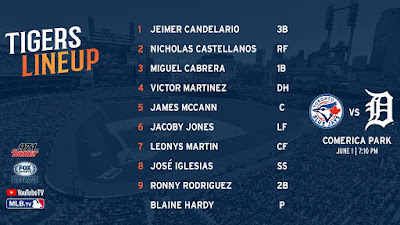 Miggy Cabrera is scheduled to test his hamstring today, and if all goes well, he may be activated just in time to pound the Jays into the grass. BREAKING NEWS: It's just been announced that Miggy has been reinstated from the DL. Oh joy. It's time! The 2018 Camping World MLB All-Star Ballot is officially open! Help us get your #BlueJays to Washington for the 89th Midsummer Classic! Oh hey, the lineup already seems so much better. Still missing Dosh, though. This is your "Just win, you assholes" game thread.